137 comments to What does it take for a worldwide consensus? Just 75 opinions. Unfortunately, “perception is reality” for many folks. When some people see a story in the media saying that 97% of scientists “agree” that global warming is human caused, it only supports their “perception” that humanity is causing the earth to warm. Sometimes, though, nasty reality can change perception. Sometimes, it’s the only thing that can. I hate the terrible weather that the world has seen recently — the blizzards in the US, UK, Europe, and elsewhere, the catastrophic rains in India, Australia, and California. But, that’s reality, and it’s not just a one year thing. The unfortunate thing is that while the world is still obsessing over global warming, climate change, or climate disruption — or whatever the new catch phrase is — we are not seriously addressing the possibility or probability of much colder years than what we’re currently seeing. Governments in the US, UK, and Europe have been ill-prepared for this winter season — and, because of the obsession over anthropogenic global warming, they are unlikely to be any more prepared five years down the road. Yup & people continue to buy lottery tickets even though the statistical odds of collecting millions is somewhere out on the end of the bell curve with shark attack & political honesty. However the advertising is slick! So, given this and the 31k+ scientists who signed the Petition Project, is it reasonable to say that the overwhelming majority of scientists think that CAGW is bunk? I wouldn’t care if they had a million opinions. It takes only one with a provable fact to prove a million with opinions wrong. Yes, that’s right, Dave (4), for nearly 2000 years virtually 100% of Western physicians agreed that bloodletting was the best frontline treatment for all medical problems. But even this degree of consensus didn’t make it true. Only the truth counts – not the consensus of believers. At the risk of being tarred and feathered for once again stating the bleeding obvious, Climate “science” relies for proof on “consensus”. “Consensus” is just another way of saying “vote”, and anything you or anybody else votes for, is politics. Ergo, Climate “Science” is a sub-branch of Political “Science”. Always has been. … a tiny semi-dried kernel of truth becomes inflated, distorted and repeated into a planetary group chant. The essence of propaganda … it has to be there to make it work … you have to connect the big lie with something the recipient already knows, and uses to validate incoming information. Your average citizen, who is actually a lot smarter than your average politician thinks, will look at an outright lie and go, “Nah, that is just plain nuts”. But if you can put a little bit of truth in with the big lie, and provide a way for your average citizen to easily link that modicum of truth with what they already know (whether true or not), then the whole lie gets “hooked” onto that previous knowledge for later review. If you keep on repeating the big lie, and keep on providing different little bits of truth to act as hooks, they start to “believe” in the totality of big lie. That is what “they” (whoever you deem “they” to be) have done, and are still trying to do. And that is why I am so passionate about what I do – I hate the idea of other folks messing around inside my head. Heathrow airport was unprepared for the snow fall in comparison to other airports. I wonder if a meeting of CEOs decided some years back on the basis of warmer winter forecasts to pare back spending on snow clearing equipment? Oh wait… that’s right, we skeptics are supposed to be the ones in bed with big tobacco… I am so confused. * I leave it to the reader to decide whether that is one of the 3%. … given … the 31k+ scientists who signed the Petition Project, is it reasonable to say that … scientists think that CAGW is bunk? No, it is only reasonable to note that, on the basis of self selection, over thirty-one thousand scientists have expressed a sceptical position about CAGW. Voting for or against something is not proof, it is opinion … in my opinion. Question: How does the Met Office work? Seven Meteorologists raise their hands. So the Chief Meteorologist walks over to their multi-billion dollar super-computer and types “7″ into the input field of The Climate Model. “69.999% probability of rain tomorrow”. Theres a lot of irony in a non-scientific survey being unscientifically adjusted in order to shore up support for an unscientific theory by people who aren’t necessarily scientists and who are’t following the scientific method. Phlogiston, Ether and Eugenics is all I have to say, and a thousand lesser theories that once were the mainstream thought of the day. Do you want to keep your job? It’s amazing that only 97% said yes. Seems a hell of a lot of qualified non-believers outside of that 75! I’ve seen this “survey” mentioned here by several of our visiting trolls over the last year. It certainly was not an impressive survey to me, but every time I was astounded at how much confidence this “97%” gave to the troll writer. I wonder if any past trolls will stop by and defend their crap? In any case, do you think we could commission a survey of climate skeptics and find that 97% of them believe that CAGW supporters are IDIOTS? 1 Million Women – A campaign of daughters, mothers, sisters and grandmothers – Committed to protecting our climate, our communities and our future, leading change for the better. Our goal is to inspire 1 million Australian women to take practical action on climate change by cutting 1 million tonnes of carbon dioxide (CO2), the main greenhouse pollutant causing global warming. “Evidence? We don’t need evidence. There’s a CONSENSUS ya know!”. You don’t have to be an expert on climate change. Just join up and we’ll guide you every step of the way. Phew.. Thanks! Thought I’d require a brain and independent thought for a minute there..
Anyhoo, upon loading the homepage, a little counter aptly titled “women & counting” whirls into life – all seven digits spinning away giving the impression it might be calculating some large statistical fact. I chuckled when those 7 digits, stopping in turn like a pokie machine displayed well under 34,000 members, however committed. That’s just roughly 3.4% of Australia’s (are they all from Oz? Not mentioned) women “committed” to the cause. Statistically, that number could easily be whittled down by the many that might have given up died, emigrated or been incarcerated since joining. Not sure if you can actually cancel your membership at all. Luckily it’s free as their affiliates pay for the site. Looks like they bought into a bummer for sure – especially after all that expensive TV airtime. If it’s anything like Adult Match Maker who, in their infinite ability to false-advertise, claim they have over 1.5 million members. Notably, if you cancel your membership nobody can use your username ever again – not even you. Meaning it’s retained by the site forever for “statistical” advertising accuracy, however, there’s only ever some 2000 regulars online and only on busy nights. That’s a HUGE 0.05% of their “members” that could actually care less for some action on a regular basis – on a busy night. Getting back to the CATASTROPHIC climate change issue (OMG!! Everybody run for MY life! ), if some 97% of these self-selected “scientists” actually do somehow believe we’re all going to hell in a hand basket, how many of them are actually changing their ways or walking the streets pawning the issue and the dangers? Statistically that could be well under 1% of those 75. If there were 750 there would probably be little statistical difference, since all humans have other commitments. In fact, the VAST majority of western civilisation as seen in many different polls wouldn’t part with any spare cash to help deal with the issue. S’pose they finally want value for money eh..? It seems our dear insanely criminal but useful idiot friend James Hansen (NASA GISS) is doing his part by getting arrested in protest rallies on a regular basis. There’s a consensus all right – Hansen is worth more that 75 “scientists” on his lonesome.. I contacted 1millionwomen with a multi-thousand-word email the other day (too big to reproduce here), containing facts and links to back them up – many from this site including Jo’s Skeptics Handbook. Also noting their site fails to do likewise in their claim. Somehow I don’t expect them to understand let alone read about oceanic 60-year cycles, sunspots, logarithmic CO2 and that a runaway greenhouse has never before occurred in Earth’s past, could never occur and exactly why. There’s money to be made in this fraud and, I bet the proprietors of that site, like many, are laughing all the way to the bank. Anyone want to be sucker number 33,622? Olaf – I’ve been monitoring that website since Nov 12. Back then it had 77,181 members. Today it boasts 82,391. So that’s 521/month average. At that rate to register 1,000,000 it will take 1,919 years.. The site is created by Climate Coolers, http://www.climatecoolers.com/default.htm a non profit organisation who’s sponsors are, wait for it….two renewable energy companies and an advertising agency. Who would have guessed. They even have access to the kindergartens so they can indoctrinate the kids early and their board members include a Al Gore ambassador!! Looks like they are only 3.6% of a million women. But add that to those 97% and BINGO! “Anyone want to be sucker number 33,622?” On checking looks like they just got her. There is a solution but it would require great sacrifice from these ladies. The average Aussie accounts for about eleven tonne of CO2/year. The average person exhales about 0.8 tonne of CO2/year (athletes up to 2 tonne/year). Looking at the photos of these fine ladies they look to be the garrulous type so say, each would exhale about one tonne a year. If they made the ultimate sacrifice for us all, that would be 33,622 (as of now) tonne of CO2/year not emitted. Of course there would be the added bonus of 369,842 tonne/year less CO2 produced on their behalf giving a grand total of 403,464 tonne/year. Think what a great example their sacrifice would be for the sisters along the lines; “ is any sacrifice too great for saving our Mother Earth”? Dara International has produced a Climate Variability Monitor 2010 to monitor climate change in the countries most vulnerable. The Climate Vulnerability Forum was established by the President of the Maldives which first met in Nov 09. Was it just me or did anybody else notice that the actors chosen for the “one million women” ad campaign pretty well all fit the comfortable, educated, middle class, Volvo driving, 2.4 protege children mold? Yes Pattoh – they were also successful women, sportwomen, business leaders, chefs (Margaret Foulton) etc. I haven’t been able to find a ‘due diligence’ or lack of case against any politician; why is that so; is a politician’s only duty to his party to get elected; surely there must be a duty to the electorate? That 97% remind some of election results in Saddam Hussein’s Iraq, only I think Saddam did a little better. Then again his subjects did seem a little keen to stretch his neck when it came time for that. Sorry guys, but no matter how you try and look at it, your main problem is that you are wrong. The principal use of good skeptics is to keep climate scientists on their toes. Bad skeptics are just plain annoying – like fleas on a dog, they won’t kill it, just annoy it. But anyway, keep patting yourselves on the back and saying how well you are doing, and how the horrible fraud being perpetuated on the world is about to collapse. Its more than an argument about the climate, its about what frame of mind humanity should take into the future, and that is interesting. You posted this two years ago. How’ve the last couple winters been for ya? What is truly revealing about “good” CAWGers like you is that you out yourselves rather easily: it’s about “more” than climate-it’s about framing humanity’s mind. Which is EXACTLY what a lot of skeptics are saying! It’s the politics, dummy! CAWGers, the ideologues and dilettantes, don’t give a rip for climate; they care about dictating life choices for others to follow-it is a bad as any legalistic religion or sect or cult. You go on and keep it up—there’s always that adage about giving a man enough rope. As a vocal sceptic in my local community, I want to be sure I have my ducks lined up, and I’m a bit unclear as to the figures in this story. The basic facts of 77 ‘climate scientists’ I understand, but I’m less sure about the figures relating to the response of the 10,000 odd other scientists who did respond. I’ve seen a figure that suggests that 82% of them also agreed with the AGW position. Regardless of the ‘puffball’ nature of the questions, we can’t afford to ignore this statistic. Forewarned is forearmed. Its more than an argument about the climate, its about what frame of mind humanity should take into the future, and that is interesting. Thank you for confessing. Most interesting that you consider “frame of mind” more important than facts. Theories upon theories generating theories gives us bad science. I’ve been a bad boy by following the evidence trail of the past to understand how this planet was 4.5 billion years ago and the changes to today. In my findings, I looked for when evaporation first started. If our planet started as a pile of chemicals, when and how was this done? Water is a very old substance and is found frozen in comets and other debris flying in space. Oldest salt(in dry form) on this planet is 1.25 billion years ago. First frozen water Ice Age was 2.5 billion years and the next never occured to the string of Ice Ages that run today at 1 billion years ago.That massive time span between must have been a meteor stike to hit the ocean to make the water vapour. The inter-relationship of gravity, atmospheric pressure, rotational speed and centrifugal force, all make for an interesting mix of facinating complexity. This gets quite deep into what it was then to today. It is our frame of mind which will decide whether we botch the future or not. The facts are what they are, it is our reaction to them which matters more. The reaction I see here in Joworld is one that somehow thinks that our current mode of life is so wonderful that we should continue it, even in the face of evidence that strongly suggests it will cause big problems for the future. And here’s the big BUT with the current bunch of prophets trying to get us all in the right frame of mind. Remember how the kiddies wouldn’t know what snow is? Well umm, err.. when the pollies asked for a ‘please explain’ from the Oracles, whaddya reckon these self anointed climatologist high priests cooked up? No prizes for guessing! Follow me John Brookes because I am the light and the way as the Guru of the new science of Humanology. If you’re interested and in the right frame of mind, I’ll make you one of my chief disciples. David Burgess @ 28 and observa @ 31 VERY GOOD! its about what frame of mind humanity should take into the future, and that is interesting. and that frame of mind is; that scientific fraud and deception, is OK because the cause is so important. The warmists thinking is vacuous and utterly devoid of logic but full of warm, fuzzy platitudes. It is our frame of mind which will decide whether we botch the future or not. The facts are what they are, it is our reaction to them which matters more. Exactly! Will we pay attention to the facts, or will we keep making excuses to ignore 28 million weather balloons, 6000 boreholes, 30 years of satellites, half a million years of ice cores, proxies up the kazoo that tell us it was warmer for most of the last 10,000 years, including 1000 years ago during the MWP and that our models are wrong, busted, biased and based on corrupted data? The facts are that we are losing top soil, soil fertility, and are unprepared for cooler and wetter climate changes, and our earnings are being wasted on programs that guarantee bankers and bureaucrats get richer while children go hungry and die of preventable water-borne diseases. You have every right to be angry. The attitude of pretending to help people while ignoring the empirical measurements is hurting good people everywhere. My frame of mind is to pay attention to the evidence, fight for truth, and not be swayed by irrational arguments. What’s yours? And, I might add: Not what you think or wish they are. You should open your eyes — try following Jo’s post at #33 to see how you look to the rest of us. Try engaging with the data, instead of just throwing “authorities” (with agendas) as us. JO could not have said it better myself, John knows the facts of this posting and does not let bother him one bit; WHY! Yes we should be conserving into less pollution and all that but at what price and how much money are you willing to put into the scam. From your comments on this great site i believe that you should be living in a mud hut with a mule for transport and hard labor and not on a electric grid causing more CO2 to be produced. OOPS scratch the mule, methane and all, So John do you actually have any thoughts of YOUR OWN with out Joe Romms blatherings and have any better ideas? Sorry for the rant JO I am just and old mechanic with the power of deductive reasoning and common sense and a love of history and John evidently does not. I can’t help saying that even if it was a real consensus of 97% of all scientists on this planet it would still be just dust blowing in the wind. They have no evidence that CO2 has caused, is causing or will cause anything. They now seem dodge all attempts to make any such arguments. The hot-spot was their ace-in-the-hole and it turned out to be a joker. Fortunately for some, unfortunately for others, the truth is not a matter of majority opinion. You don’t get to vote on what the laws of physics and chemistry are. …even in the face of evidence that strongly suggests it will cause big problems for the future. You have had a very long time to show us that evidence and yet your best effort boils down blind faith in the gods of global warming. Does it not embarrass you to make yourself the blog jester all the time? This makes one wonder whether presenting facts and logical argument is the way to enlighten those who believe in AGW. I have previously argued that presenting the evidence and a reasoned argument does little to change peoples views on AGW. Whereas, an emotive appeal can swing people to accept the idea that AGW is a fairy tale. Many accept AGW as a scientific fact. Should we instead be donating funds to a massive PR campaign, devoid of facts that presents the sceptic argument in purely emotive terms? After 3 science, math, and engineering degrees and 30 years in both industry and now academia, I can say that the ability to think logically and draw conclusions well enough to be a successful mechanic is very rare, especially in academic scientists without real-world experience (most of them). People with those skills are actively selected out of climate “science” (by the old-boy peer review network) as a threat to the continuation of the government funding gravy train. It is our frame of mind which will decide whether we botch the future or not. Nature is not fooled by tricks from a Dale Carnegie course, John. To not botch the future you have to be right, not just righteous. You assume the facts are easily known, and require no due diligence from you other than blindly believing those who claim expertise. How, then, do you explain that only 3 years ago thouse “experts” (Hansen, MET, etc) were claiming that England had seen the last of winter snow, whereas now, they are claiming England will see 30 years of bitter winters — all due to the same cause (for which the “science is settled”)? To those with the power of reason, the contradictory predictions from the same theory count as a refutation. In logic, if you can draw two contradictory conclusions from the same premise, that proves the premise is false. What do you use for logic? I had a talk with my brother-in-law, who lives in Portland and does audio and video productions. He recommends ridicule, as the most effective emotion to attack with. It helps greatly if the object of the attack IS ridiculous, which Jo’s most recent post shows very well. Smart: “Would you believe, there is a SWAT team outside getting ready to break down the door and rescue me? We could use Minnesotans for Global Warming’s Michael Mann look-alike for the Maxwell Smart character. He would be questioned by Uncle Sam for running a scam. The ridiculous dialog has already been written by the AGW proponents, all that is needed is selection of the best bits. “Sorry guys, but no matter how you try and look at it, your main problem is that you are wrong. The principal use of good skeptics is to keep climate scientists on their toes. Bad skeptics are just plain annoying – like fleas on a dog, they won’t kill it, just annoy it. Since I can not defend one of John Cooks typically misleading or dishonest presentations.As shown here.I will babble onward hoping that will somehow refute the premise of headline in this blog entry. The main problem is that you have trouble dealing with reality swirling around you. When it comes to “consensus” the only thing that counts is the “con” because that is all it is, a con job. What’s the matter, John, you seem rather sad and forlorn? It is sad when reality comes crashing down upon you, isn’t it? Be of good cheer, some green carpetbagger will figure out another way to scare the he’ll out of everyone and scam the taxpayer. What would you do without a “cause” to concern you, John? Typo “he’ll” should be “hell”. My computer is in the shop and I am using my little boy’s iPad. I think we have reached the point where the challenge is to suggest ways that are available to politicians to back down. I don’t see “I was lied to” as enough. Any thoughts? ….Should we instead be donating funds to a massive PR campaign, devoid of facts that presents the sceptic argument in purely emotive terms? I believe you are on to something. Once this got planted into the political world, emotive terms would perhaps be the best way to deal with it. It may be that we have to continue to fight on several levels. From my perspective, the average scientist has little interest or aptitude for politics. Similarly, a poor understanding of the darker side of human nature. 1. Are the adjustments done to the Australian temperature record reasonable in the eyes of the Australian skeptics? 2. If the adjustments are NOT resonable, are they sufficient for legal challenge as the impending doom (forecast due to the records) is used to obtain taxpayer funds for research, careers and legislation? There must be statisticians who can answer the first, and lawyers, the second, who follow JoNova. I have lurked here many times but this may be only the first or second time I have posted a comment (memory fails me). Regardless, I enjoy this site immensely and thank you for hosting it and the wealth of information it houses. I break my relative silence because I believe I can add a bit to this particular story beyond what was said by you, the Hockey Schtick, Ambler and Solomon. I did a similar dissection of the AGW-fan fave 97% mantra in February of last year and have offered the observations several times since, so it is a bit of a rehash but with some further elaboration. Sorry but 97% of the climatologists currently writing about global warming do think it is real and it is man-made. That means the debate is pretty much over. Should the survey have ever even been published in the first place? At the center of the critical charge against Eos was none other than James Annan. As Annan explains there, he was stinging because in late 2007 he had a hand in a similar survey submitted to Eos that had been flatly rejected. In that “Odd Couple” moment, Annan and Roger Pielke Sr. had worked together to help Fergus Brown construct a survey of climate community views on IPCC AR4 WG1 (that doomed collaboration has since deteriorated quite a bit — ironically, on the precise eve of Climategate Pielke writes there of Annan’s “lack of scientific rigor” — an omen perhaps of the following day’s “travesty”). After submitting to Eos the trio waited months without word. Some additional gentle prodding finally prompted an answer from then AGU Executive Director Fred Spilhaus (he has since stepped down). Spilhaus emailed them a brief rejection that in Annan’s words was “on the grounds that they wanted to focus only on science, not opinions.” As he notes, Eos is a newspaper and the Forum section to which they submitted their manuscript is not a traditional peer-review publication. They subsequently submitted their manuscript to Nature Precedings and were surprised to suffer yet another rejection, at which point they apparently accepted defeat in getting it published. The scab was removed however when Eos, seemingly suffering from amnesia, published the D&Z opinion poll summary January 20, 2009, and as a feature article no less. Pielke, like Annan, cried foul, claiming that Eos was guilty of “an obvious double standard [that] raises serious questions on the role of Eos as an objective vehicle to communicate climate science issues.” Here is how Eos categorizes its submissions. With the rejected “BAP” survey as precedent, the D&Z offering should also have gotten the axe. I think Pielke’s “double standard” characterization is thus a direct hit. Reject both or neither of them, but do not cherry-pick the survey more to your liking. How does the D&Z “feature” publication mesh with Spilhaus’ desire to “focus only on science, not opinions”? It simply doesn’t and therefore should never have been published. We have been rebounding from the Little Ice Age for over 200 years! That number should have been 100% and I bet that the 3 respondents who did not go with “risen” chose “remained relatively constant” (if any chose “fallen” they should have their credentials checked). I admit I hadn’t considered, as had Solomon, that some respondents had potentially included the MWP within their timeframe, but I would bet that very few did and thus assess the question to be absolutely irrelevant to the debate. If the word “consensus” is at all to be allowed to raise its ugly head in this discussion, it should be on the point of post-1800 warming. Silly. Now the second question is where it gets interesting. Why do you think it was phrased in that manner? Why didn’t they use a less ambiguous statement more in line with the IPCC claims? How does one quantify a “significant contributing factor?” What if the question had been this instead: Do you think human activity is the most significant contributing factor in changing mean global temperatures? What do you think are the chances that James Hansen and Gavin Schmidt sent out a note making it mandatory that their underlings take the survey? 97%? Maybe I should file a FOIA request and find out. Cheers! Ah, good times. Why D&Z was deemed worthy while BAP was shunned is inexplicable…well, no it isn’t. We have all learned “Why D&Z” over the last two years: they needed a good chant as Joanne calls it, and boy did they ever put it to use. Ugh! Now you understand why I don’t do this much. Start with cat-like curiosity (you know how that ends), add a sprinkle of ADD and OCD, and you get posts like this. Sorry. I’ll finish though with my observations about the Glover graphic and why I labeled it misleading. 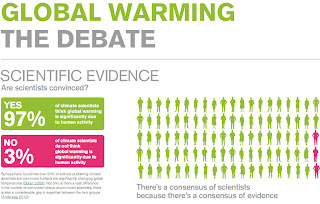 97% of climate scientists think global warming is significantly due to human activity. Sneaky. The survey did not state that GW is “significantly due to human activity.” Rather, it stated that human activity is a “significant contributing factor in changing mean global temperatures.” Big difference and I doubt the editorial content change was unintentional, hence it is misleading. Finally, I’ll add a bit of snark because I noticed something else about the graphic that fits the false AGW consensus claims beautifully. If you take a close look at the human silhouettes Glover uses (of course the 97 “good guys” are green), you will notice that of the 100 figures, only ten are unique (each of the ten unique figures is cloned or flopped ten times to “round out” the 100). It is a perfect illustration of how a minority view can be amplified and cloned through decades of repetition and NGO/GO alliances to give the perception of consensus. The nonsensus is then exaggerated and strengthened with a heaping dose of vaunted cherry-picked pseudo-evidence (the schtick busting up the MWP consensus for instance), marginalization of skeptics who don’t toe the line, journal refereeing, pal review, etc., and eventually you get the outwardly-enforced post-normal “consensus” that has infected climate science. Hmm. It must be a common tactic since “Yamal” and “upside-down Tiljander” and “independent reconstructions” and “there’s a hockey league” just immediately popped into my mind. Wow. We’ve got some catching up to do. Sorry for the diatribe. Not my first. Doubt it’ll be my last. Keep up the excellent and insightful work, and as always, Cheers! Jo: the sentence below (lifted from your commentary) puzzles me…. Anybody else bothered by it? That left the 10,257 scientists in disciplines like geology, oceanography, paleontology, and geochemistry that were somehow deemed more worthy of being included in the consensus. Yes, it doesn’t read right. But cut Jo a little slack if you can. She turns this stuff out day after day and sometimes just plain has to hurry throug it. She’s done a heroic job, all things considered. I don’t have any problem with Jo, and fully understand the implications of that sorry survey. And Jo doesn’t need to even make a correction in order for rational beings to understand what she’s attempting to say…. but why not help her out (on those rare occasions when that possibility arises). ?? Has anyone considered the possibility of bringing a “whistle-blower” suit against any “warmist report done under government grant or contract, where it’s likely that it can be proven to be erroneous, either because of fraud or incompetence? I think you guys should read the section again. It isn’t Jo, she is quoting Lawrence Solomon. The two researchers started by altogether excluding from their survey the thousands of scientists most likely to think that the Sun, or planetary movements, might have something to do with climate on Earth – out were the solar scientists, space scientists, cosmologists, physicists, meteorologists and astronomers. That left the 10,257 scientists in disciplines like geology, oceanography, paleontology, and geochemistry that were somehow deemed more worthy of being included in the consensus. solar scientists, space scientists, cosmologists, physicists, meteorologists and astronomers. should have been left in the group? I don’t know why, perhaps John Brookes can explain……. Can’t count on that damn sticky Sarc key either. I think the idea of lawsuits is good. The left thrives on that method to provoke promote whatever agenda they have in mind. It seems potentially rewarding to use their methods. 10,257 scientists …… 75 said yes … that’s 0.73% (75/10257) who believe in AGW. You’re right ! I now recall reading that in the original Solomon at another site, and figured I had misread and didn’t bother going back. So we can’t be editing the man’s stuff on Jo’s site. A pity. “deemed unworthy” rather than “worthy” would have almost done it, but the associated number would need to also be reduced to (10,257 – 79). While we’re doing this word-smithing, Mark D – note that it’s “denis” (or “Denis”). The second “n” was not included, either accidentally dropped or perhaps in hopes it would be appreciated by the good St. Denis. Although the climate change bandwagon may appear to roll on unstoppably regardless of all doubts or discredit, it has in fact suffered a serious loss of momentum in public acceptance. It has lost power and is now only coasting while trying to maintain a face saving facade for those so deeply committed that any graceful retreat is unthinkable. Worse still from the alarmist perspective, has been the painfully obvious failure of climate itself to cooperate. For the past three years all over the world savagely cold winter weather has repeatedly set new records for snow and low temperatures. Time after time global warming conferences have been greeted by record and near record cold weather. Trying to dismiss this as merely coincidence or just weather, not climate, has lost all credibility; especially after it has happened repeatedly amidst a background of extreme winter conditions over large areas. Continuing to offer this increasingly lame excuse has only made it look more like a lie or delusion than an explanation. Regardless of the ongoing hype and spin of the diehard proponents of AGW, the attitude of a large majority of the electorate has turned decisively against the idea of any imminent threat. This shift in sentiment is unlikely to reverse anytime soon. It developed over time and involves not just the Climategate emails but a much wider shift in the balance of public awareness as well as a sense of betrayal and dishonesty by researchers claiming certainty and righteousness. Fool me once, shame on you. Fool me twice, shame on me. Once a belief is abandoned, few people readily return to something they have decided was false. All the spin and hype is now achieving is to exacerbate the discredit. For supposedly intelligent people, this kind of behaviour does not indicate it. Meanwhile, as the warmists continue their doomscrying and seeking further hundreds of billions of dollars to carry on their vast charade, the whole economic structure upon which everything depends is teetering on the brink of disaster with little effort to address or to even recognise the very real and present dangers which confront us. Good God Denis I am sorry! No need to hold your head in your hands. At the risk of being unscientific I would point out at this juncture that Miskolczi’s 3 papers from 2004, 2007 and 2010, which are groundbreaking and unrebutted to an almost Einsteinian extent [and if I may digress I would suggest a new sobriquet incorporating Einstein's name and perhaps Michaelangelo], have had no citations at all, although I could be wrong. If one stops even for a brief moment and considers how group-think works one can readily see how the mutual reinforcement would enable pro-AGW ‘scientists’ to dominate such a survey given that they, as the e-mails eloquently demonstrated, effectively control the main climate publishing venues. When you throw in vast political support, vast financial rewards and Kafkaesque treatment of dissenters [again Miskolczi is a salutory example] then you can see that an effective scientific monotone, as found by Schneider, will result. The unfortunate thing is that Schneider’s vomitous paper is being readily used by craven politicians like Combet to justify his government’s position on AGW; and about Combet I hope Jo will have more to say shortly. Walter has a PhD in marine science including post graduate training and professional experience in fisheries biology. His reef experience includes some 50 years of fishing and diving on coral reefs including those in the eastern, central and western Pacific areas as well as the Indian Ocean and tropical western Atlantic region. He has had the opportunity to study two reefs every year for 10 years each. One was in Florida the other on the GBR. He has also been able to extensively dive reefs in both overfished areas and sustainably fished ones as well as a number of remote un-fished oceanic reefs. His Barrier Reef experience includes over 1000 dives ranging from far northern Cape York to the Capricorn group at the southern end of the GBR. I would love to hear the 97% comment on recent global weather. Consensus or Con? – global warming…….. Global Warming, Fanatics, and Freedom….. Evidence About The 1970s Global Cooling Consensus Keeps Piling Up….. Founding director of the Tyndall Centre for Climate Change: ‘Time to ditch consensus’……. a) why do ice core data show the CO2 increases occur about 800 years AFTER the temperature increases? b) why is there no correlation in the 6E8 year record between CO2 (GEOCARB)and temperature (PALEOTEMP)? c) why does the GISP2 ice core data show the Medieval Warming Period 2F higher, Roman Warming Period 4F higher, and Minoan Warming Period 5.5F higher than today? Lets see, over 30% of scientists selected because they worked in the earth sciences responded to a voluntary survey. Most would accept that as a high response rate. The survey was market tested to be as unbiased as possible. 82% accepted that human induced climate change was occurring. Of those working in the field of climate science 97% accepted that HICC was occurring. So what would you guys accept as incontrovertible ‘proof’ of consensus?. We know 2010 will be the hottest year on record, 2011 will probably be hotter. Temperatures continue to rise at double the rate of the last century. Sea levels are already rising at double the rate of the last century. If you don’t believe provide evidence to the contrary. While there’s considerable doubt as to the validity of the referenced survey (particularly regarding your interpretation), it isn’t votes that count in science. If you really put stock in such nonsense, what about the conflicting surveys and petitions, such as the 31,000 scientists who signed a petition declaring that there’s no evidence that man has made a major impact on climate. There was also one other petition, that I know of, consisting of about 1,000 scientists sending a similar declaration to the UN. How can any rational being with even a minimal background in climate history ignore the Medieval Warming Period? There was no industrial activity back then and it was as warm or warmer. There is also no doubt that the phenomena was global. Whats more, there were several earlier periods during this interglacial when it was even warmer! Whether or not 2010 is the warmest on record, and 2011 is even warmer, hardly matters. The differences in temperature being debated are miniscule, and likely swallowed up by error in determining one temp for the planet. But if you want to believe in the accuracy of these temperatures, there has been no statistically significant warming for the past 15 years – even Phil Jones of IPCC / CRU infamy has admitted that. 2010 has been just another year of natural recovery following the 500 year little ice age which ended 200 to 300 years ago. There is considerable data available, covering millions of years on both CO2 and temperature. At no point does this show that the level of CO2 had anything to do with the planet’s temperature. Finally, those who believe the baseless CAGW claims, are the ones obligated to provide evidence before we permit politicians to take radical steps (assuming such steps are even possible), but no such evidence has yet been provided. Where’s the proof? The observations of reality (real data, not computer models) do not support this falsehood ..
GoFigure: If you check the warming trend (http://woodfortrees.org/) for the last 15 years you will see that every measure; HADCRUT3, GISS, UAH and RSS show a warming trend greater than 0.12 degrees per decade. As for the referenced survey it was rigorously conducted; unlike the Oregon petition which was preceded by a dishonest information campaign and did nothing to ensure that the people who claimed to be scientists were. Furthermore it was established more than 15 years ago when the evidence for AGW was not as strong as it is now. Studies of the MWP show that it was a localised event that occurred at different times in different parts of the globe. As you can see from the graphs on this page: http://joannenova.com.au/2010/05/gullible-rudd-steps-right-in-it/ any 50 year warm period between 500 and 1500 AD is claimed as demonstrating the MWP. Every one of these graphs claims the MWP occurred at a different time. In your article you talk about rational people using the satellite record. Well the satellite record closely reflects the surface temperature measurements which show temperature rise of ~ 0.15 per decade for the past 30 years. GBees: You want proof, here’s the data from CSIRO about sea level rise, http://www.cmar.csiro.au/sealevel/. here’s the evidence that the current rate is double that of the last century: http://www.cmar.csiro.au/sealevel/sl_hist_last_15.html. Lets see what evidence you can produce to refute these measurements. DavidR: Perhaps you could explain why sea level rise rates that are 42% of the average over the last 15,000 years (and 1/5 of the maximum rate about 8,000 years ago - link) represent some sort of crisis that Humankind needs to respond to right now. And, how does this, in any way, support the AGW hypothesis? BAM! proof of AGW right? Notice that pesky 30 year cooling period starting about 1940? OOPS it’s not there! Not even a blip. Why DavidR? Lets see what evidence you can produce to refute this analysis. Putting aside the usual warmist claim about the Oregon petition, I notice that you had nothing to say about the other more recent petition to the UN. It involved many more than 77 scientists, as I recall. I repeat this only to point out again that surveys and petitions are not evidence of anything but opinion, and there is lots of money and politics involved in this global warming issue, so strong opinions abound. In the long run it is evidence, not votes, that count in science, and neither warming nor sea level is the issue. The question is whether our industrial activity has had a significant impact, via its CO2 contribution, to what appears to otherwise be natural warming. “Statistically significant” is the operative term used by by Phil Jones, (I assume you understand the meaning of that phrase) but, as stated earlier, it does not matter. (I don’t recall referring to satellite temperature measurements, but I would trust those more than the surface temperature recordings.) The planet has only been warming for (roughly) the past 200 years, (at least for those of us who recognize that there was also an earlier little ice age). That’s still a much shorter period than experiened during the MWP. While there has been no statistically significant warming recently, we may still have another couple of centuries of natural warm(er) weather ahead of us. You’re asking the skeptics for evidence? Do you not understand that it is the CAGW believers who must provide evidence? The fact that it is warming is proof of nothing since our temperatures are well within natural variation. Further, CO2 was higher during three ice ages and going into one ice age. Historical data consistently show CO2 increases following (not leading) temperature increases, and by 800 to 2500 years each time. In the short term (and more recently), temperature variation during the past two centuries has been at odds with the consistent slow increase in CO2 level. In summary, you have argued that the planet’s temperature is increasing and that the sea level may be rising, both likely to be normal events, and neither of which appears to have anything to do with our industrial activity unless it can be shown that CO2 is driving our temperature. Furthermore, it seems that the “team” learns nothing and forgets nothing. DavidR, if you want to support people who make it difficult/impossible to access their data, that’s your prerogative. Just don’t expect us to tumble like you obviously have. I suspect DavidR quickly retired from this blog after he realized the absurdity of his claim, that the various MWP studies covered different short time periods. Each study, by the very nature of the project, covered a time span at least as long as the MWP, and often even longer. DavidR, don’t put any faith in the CSIRO (Labor govt. lackie, Parroting IPCC stuff) or the IPCC itself. We already know where that lead …..
As your graph shows, sea levels in the past 15K years have risen about 110m or 70cm per century. However of that, 107 m occurred in the first 7500 years and 3 m in the last 7500, years. So the rate for the last 7500 years has been about 4cm a century. Suddenly we are seeing 30cm a century with predictions of up to 100 cm of more. That’s why rational people are asking why and what needs to be done about it. If, as the science says, it is caused by increased C02 in the atmosphere and we know that without changing our ways we will see vast increases in C02, normal sensible people recognise the need for action. Millions of these people live close to sea level in homes and cities that can’t just be picked up and moved away from the sea as they could 7500 yeas ago. The 100 scientists figure is collated by Senator Inhofe who is a well known opponent of AGW theory. Given the number of scientists in the world finding 1000 who disagree about AGW should not be hard. Even the original survey we started discussng found nearly 600 and that was a statistically meaningful survey. Unlike the selef selecting petition by Marc Morano. As for the 900 studies on C02Science that purport to illustrate the MWP, even a cursory glance through them shows that their was no consistent world wide period of warming such as we are seeing now. Every study covers the entire period but none show significant warming for more than a few decades. Suddenly we are seeing 30cm a century with predictions of up to 100 cm of more. That’s why rational people are asking why and what needs to be done about it. Of course, rational people would note that the current rate of rise precedes any significant increase of Human-produced CO2, so wouldn’t assume a (backwards) cause and effect relationship. That would be highly irrational and typical of the BS pushed by those with political agendas. If, as the science says, it is caused by increased C02 in the atmosphere and we know that without changing our ways we will see vast increases in C02, normal sensible people recognise the need for action. And, if pigs could fly they would have wings. The whole point of this blog (which you haven’t read, I wager, and cannot refute) is that the science does not say anything of the sort. The so-called “science” is about as rational as assuming that Human-produced CO2 from 1940 onwards is the cause of warming and sea level rises starting in 1820. You claim that is easy to find scientists who are skeptics applies equally well to finding warmists. The recent survey you were defending in earlier commentary, where 10,000+ scientists were provided with surveys and, after 3000 responded the so-called researchers (two Univ of Illinois researchers) applied all manner of suspect criteria to eliminate undesired responses. The net result; basically only a handfull of responders were deemed “eligible”. (They might as well have just sent surveys to the IPCC staff.) Notice that at least 2/3 of the originally selected scientists did not believe the issue was important enough to even bother with. That may be the only valid opinion which can be derived from this particular survey. The point I made earlier is that opinion SURVEYS don’t really matter. In science it is EVIDENCE and not opinions that matter. Why persist in a dispute over an obviously meaningless matter when you can’t even provide a cogent rebuttal to a very important and basic issue, namely the 900+ MWP studies which indicate that it has been as warm or warmer during the MWP as well as on several occasions during our current interglacial, the most recent being the MWP. (full details available at co2science.org) You seem to have decided, just as the CRU folks in their emails, and their mode of operation, that it was urgent business to make the Medieval Warming Period go away, because neither they nor you can deal with the facts. (Completely understandable for the IPCC, by the way, since otherwise their funds would have soon been withdrawn! In fact the UN folks are already busily searching for other Chicken Little projects. But what’s your excuse? Arguing about sea level rise/fall is a similar situation. There appear to be experts on both sides of the issue. Clearly sea level has been increasing since the end of the last ice age. Any graph exhibiting the past 15,000 years of sea level shows, basically, a constant increase over the entire period, but, by comparison, the rate of increase has flattened out out over the past several thousand years. Suppose there has been an increase in rate of rise recently. Is that not to be expected, following 200 years of global temperature increase (apart from the past decade or two)? Surely you are not prepared to deny the relationship between planet warming and sea level? But …. been any measurable increase at all recently, and (2) so what if there has? Our warming has clearly been within natural variation (remember, you couldn’t refute the MWP studies), and we may have yet another century, or more, of natural warming. Neither does your comment on the harmful level of CO2 compute. Our CO2 level is rising at 2 ppmv per century, so at current rates that could result in a level of 800 ppmv (or thereabouts) over the next century. Still a trace gas, but plants will love it. Sailors assigned to submarine duty evidently live reasonably comfortably at 3000 to 4000 ppmv of CO2. I doubt that anyone is suggesting we delay action until that point, but there is PLENTY of time for technology, as opposed to politicians, to deal with this situation. Sailors assigned to submarine duty evidently live reasonably comfortably at 3000 to 4000 ppmv of CO2. I don’t know what the limits were or what the actual concentration was, but, yes, we did survive quite well in concentrations significantly higher than what is normal in the atmosphere. And the CO2 scrubbers worked quite well at limiting the concentration. Your quick perusal of the data was clearly just that. Permit me to suggest that this perusal should not be performed without (1) wearing eyeglasses, if applicable, (2) smoking nothing stronger than major brand cigarettes, (3) a high school education, (4) maintaining (at least) a partially open mind. Were you perhaps expecting every day, every week during the several century MWP to always be warm? After all, in the last two hundred years there have been several periods of cool periods, for various durations, many involving one or more decades. On the other hand, using your interpretation, we could throw out the evidence that there’s been any warming in the past 200 years. Let’s get real, shall we? You will recall that even the UN is no longer backing Mann’s “hockey stick” graphs. And then there’s the fact that more data on MWP is coming in almost every week confirming the earlier studies. rational people would note that C02 levels started to rise in the mid 19th century, significantly predating both the rapid rise in temperature and sea level. GoFigure, We are currently seeing a worldwide increase in temperature. The 900 studies on C02Science do not show any worldwide phenomenon. That is the difference. Claiming that a warming period in one part of the world in one century and another warm period in another part of the world in another century illustrate a ‘warm period’ is just nonsense. Scientific studies covering all the studies show that there was no consistent period of warming worldwide anytime between 500 and 1500 CE. The methodology of the Illinois survey is what sets it apart from the adhoc name gathering of Inhofe, Moreno and the Oregon petition. This survey doesn’t claim to prove that AGW is occurring, it does however show that around 80% of scientists working in earth sciences consider that it is occurring. That’s about 2500 opinions out of 3100. If you had a reasonable understanding of statistics you would know that that the estimates would be accurate to within 1 or 2%. The analysis made by this website claiming it is the opinion of just 75 scientists is equivalent to one of those schoolboy stories explaining why I’m doing all the work in the country. Funny but obviously wrong. Millions of these people live close to sea level in homes and cities that can’t just be picked up and moved away from the sea as they could 7500 years ago. What makes you think it was easy 7500 years ago? More of the population (of wealthy countries) is far more mobile now than ever before in Mankind’s history. The percentage of personal wealth necessary to more across a continent, if necessary, has never been lower than today. It will continue to become lower still, if we don’t destroy our economy and civilization chasing nonsense “solutions” whose only effect is to enable tyrannies. Each of the 900+ MWP studies represents measurements at one location and yields a relative temperature history spanning more than a thousand years. It should not be difficult to understand that practically every site, at times, will show significant temperature variability. But, over the period in question (800 to 1200 ad), there is a recognizable trend. As a current example, over the month of December 2010, in my area, temperatures averaged 7 degrees below normal. That sizable variation will severely impact the computed anomaly over a relatively long duration. There were no doubt other earlier periods at this location with similar temperature spikes, either up or down. Despite that, it’s pretty clear that, overall, this area looks like most other areas. There is nothing unique about this location. It’s just another of our urban heat islands. Your understanding, after your own admission of having taken hardly more than a glance at those studies, obviously resulted in you taking a micro rather than a macro position. (and climate is NOT a micro issue!) You’re arguing that such spikes imply that there was no consistent warming during the MWP. But local temperature spikes are always there; that’s the very nature of climate. Even so, if you had looked more closely you would have found a number of studies which show a temperature anomaly peaking near 1000 AD, and which slowly drops off in both directions. It is ridiculous to demand that each site reflect your view of what a global event is. That contradicts your position that there has recently been global warming, because it is not happening now, and never has (probably not even when the planet was a snowball). as you obviously haven’t bothered to do. As I pointed out C02 levels started increasing in the middle of the 19th century. Temperature has been rising since then. Sea levels rises have been way above average since 1880. This is what your references show. Sorry what did I miss? I couldn’t have produced better data supporting AGW if I’d tried. The CSIRO has changed its opinion since it spent 11 years under a Liberal administration. Are you too young to remember the Howard government and its 11 years of dishonest denial of AGW. Make that “The CSIRO has not changed its opinion”. A high school eduction qualifies you to go yo university and not much more, an undergraduate degree teaches you to learn, a masters degree to research and a PH.D to be an expert. I only have a Masters, but that does qualify me to discriminate between science and nonsense. Local temperature spikes are virtually irrelevant when averaged over more than a thousand sites as is done by all the scientific studies of temperature. You claim that temperatures in your area were 7 degrees beloe normal. Where was that? so we can check. Of course it is possible you are right bur once again large local variations are virtually irrelevant. Based on over 1000 sites, 7 in one location translates to 0.007 in the global average. As your graph shows, sea levels in the past 15K years have risen about 110m or 70cm per century. However of that, 107 m occurred in the first 7500 years and 3 m in the last 7500, years. So the rate for the last 7500 years has been about 4cm a century. Suddenly we are seeing 30cm a century with predictions of up to 100 cm of more. First: It’s not my graph — it’s based on a survey paper by Fleming, Kevin, Paul Johnston, Dan Zwartz, Yusuke Yokoyama, Kurt Lambeck and John Chappell (1998): “Refining the eustatic sea-level curve since the Last Glacial Maximum using far- and intermediate-field sites”. Earth and Planetary Science Letters, 163 (1-4): 327-342. Second: You need to learn how to read a graph. Look at the section you are talking about ( the last 7500 years) ): Note that the scatter in the raw data points is +/- 2 meters or more within a few hundred years. You have apparently mistaken the average of these data points for the data itself. The rate you so confidently quote should be 4 cm plus-or-minus 100 cm per century, for the last 7500 years. There is nothing unprecedented or even unusual about the current rate of 3mm/year — especially as the Earth is recovering from one of the coldest periods in the last 10,000 years ( NOAA Greenland ice core ). Third: Predictions are not data (although you have tried to slip them in) — Especially if the predictions are from an hypothesis (AGW) that has, to date, shown no predictive skill distinguishable from chance. The whole point of Joanne’s blog is that the data falsify the AGW hypothesis. If you wish to argue otherwise, try refuting the arguments in The Skeptic’s Handbook. Simply assuming your argument doesn’t fly. Being qualified and being able are different things, as you so ably demonstrate. Your claim that temperatures have been steadily rising is also bogus. From 1940 to 1975 it was cooling. Even Holdren, Obama’s science adviser was wringing his hands back then about the next ice age. We are right now in the midst of another period, which began in the late 90s, and is continuing, where there has been no statistically significant increase in temperature and where, in fact, for the past several years there has been some cooling. Apparently, you see whatever you want to see — you may have a career in climate science! From 1850 to 1950, the Human CO2 production rate increased from near zero to 1.5B Tonne/year. The rate of sea level rise has been steady since 1910, and shows no sign of following the Human CO2 production curve. The rate of temperature rise varies in a pattern independent of Human-production of CO2 and has decreased in the last 20 years. If you want to claim that A causes B, then, at a minimum, B must be correllated with A. The hypothesis that sea levels and temperature are directly caused by Human-produced CO2 fails since the rate of sea level and temperature rise is uncorrellated with the rate of Human CO2 production. You seem to have a problem reasoning from data. Of course, the real test of a theory is its predictive skill — which, as I’ve already referenced, is essentially zero for AGW. So now all you have to show is a period of warming due to human emissions of CO2 THAT’S MORE THAN A FEW DECADES LONG and you’ve got me convinced. So you’re OK with a bunch of ancient tree stumps dug out of bogs in a handfull of locations as representative of global Ts for a thousand years as depicted by MBH98 (hockey stick). So do that math for me again, what percentage of “1000 sites” does MBH98 represent? Cherry pick convenient interpretations much? lets see, start school at 6, get a PhD by the time you’re in your mid to late 20′s. I’d say the only guarantee is that that makes you an expert at being a student. Also an expert in self adulation if you think unless one goes to uni, one is not an expert in anything. p.s. can you also discriminate between science and nonsense-science? Evidence so far (as gleaned from your posts) suggests no. Correlation (dubious or not) is causation? Is that what you’ve learned doing a MASTERS master David? The fact that you’re unable to think what else may have caused the warming, so you attribute it to CO2, only demonstrates ignorance, nothing else. Shoot yourself in the foot much? Perhaps the correlation/causation issue needs further clarification for our friend. I’ve been steadily putting on weight since 1935. Fairly good correlation with the sea level rise (such as it is), so perhaps I’ve caused it. But what puzzles me is, I really haven’t spent much time during the past 75 years at the beach, standing in water up to my nose. DavidR doesn’t believe (i.e., can’t admit) that there were any earlier natural warming periods. But that’s the line the warmists must take. They have enough problems trying to pass off flakey or non-existent correlations and computer models as evidence. Once they admit the MWP was very likely real, the jig is up. Phil Jones (or Michael Mann, I forget which) has already been quoted as (reluctantly) stating that if the MWP data is good, that’s a whole different story. Incidently, does there exist a summary across those MWP studies – something like a probability graph across time (based on the fraction of studies which at each point in time show a temp as warm or warmer than now and/or satisfying some fixed constraint on significance of the anomaly size? The causative effect of CO2 on global temperature was identified in 1897. The evidence BobC provides is consistent with the theory. No climate scientist has ever claimed that CO2 is the ONLY cause of temperature variations. What they have said is that increasing CO2 will cause an increase in temperature. Claiming that AGW is not occurring because there is no tight correlation between CO2 rises and temperature rises or sea level rises indicates a simplistic view of the climate. We can see from BobC’s post at #90 that there is a good long term correlation between the figures. GoFigure acknowledges that it is the average of large sets of independent data that gives us the best evidence. The averages from over 1200 long term studies indicate that the MWP while it existed, did not cause a global temperature variation (~+0.2) of the significance claimed by contrarians. And certainly not one that equates with the rapid increase that has occurred since the start of the industrial age. In fact since the start of the holocene 8000 years ago the average temperature drop is about 0.1 degree per millenium so a decline in the last 1000 years was to be expected. Virtually all the drop in temperature since the start of the holocene has been reversed in the last 100 years and the known cause is our CO2 emissions. The rate of temperature increase over the past 15 years has been double that of the last century. That rate will be statistically significant once sufficient years have elapsed, and given the temperatures since Mike Hulme made his statement may well be statistically significant now. Lets see what he says this year. Statistical significant means a 95% probability that CO2 is the cause of the rise. Remember the original survey showed that 2500 out of 3100 scientists who responded agreed that AGW was occurring. That is not the 75 opinions claimed in the article above. DavidR quote: Claiming that AGW is not occurring because there is no tight correlation between CO2 rises and temperature rises or sea level rises indicates a simplistic view of the climate. Hopefully you’re talking CAGW. There’s no point otherwise. But in any event you’re missing the point: There is no evidence showing that CO2 has, in the distant past, or recently, had any impact on temperature. Do you not realize that the only correlation between CO2 and temperature is over long periods of time (800 to 2500 years) and in that case it is CO2 variation following similar earlier variation by temperature? DaveR quote: We can see from BobC’s post at #90 that there is a good long term correlation between the figures. CO2 steadily increases. Temperature drops off in at least 3 periods beginning in the late 1800s. CO2 increases at very different rates during some of the warming periods. What correlation ? DaveR quote: Statistical significant means a 95% probability that CO2 is the cause of the rise. Statistical significance in this case implies whether or not there has been any warming. There is no evidence that CO2 is the cause. DavidR quote: Remember the original survey showed that 2500 out of 3100 scientists who responded agreed that AGW was occurring. That is not the 75 opinions claimed in the article above. AGW is not the issue. We may in some unknown way be contributing a bit to warming, but it’s not via CO2 and neither has any other link been established. You clearly have no idea what statistically significant means, nor what a correlation is. These are statistical terms with precise meanings, not subject to vague layman interpretations as you are making. The scientific mechanism by which greenhouse gases cause warming is scientifically well understood, not as you claim unknown. Neither is it bit, it is the predominant long term factor. Given that there are at least 15 known greenhouse gases it is not surprising that there isn’t a tight correlation between CO2 rises and temperature rises. Nevertheless there is a strong correlation as shown be BobC’s graphs. As the survey showed, more than 2500 of 3100 scientists (82%), selected because they had professional knowledge in the area, who responded to the survey, agreed with the proposition that global warming is significantly man made. This is not, as claimed by the article above, a mere 75 opinions. The article above pretends that the evidence for a scientific consensus is based on a small sample, the reality is that it is a consensus of more than 80% of the scientists who responded. Only a very small percentage of those received funding relating to climate science. Yet 82% of the others who were losing funding to climate science agreed with them. So the response is not biased by funding issues either. It’s clear that you are in denial, either not capable of, and/or not willing to participate in a rational discussion. You base “truth” on surveys of “scientist” opinions rather than on science, and even then you deny the validity of any such survey which conflicts with your beliefs. You speak of AGW when it is only CAGW that matters. You see “evidence” of CO2 causing the planet’s temperature to rise where it does not exist. You deny the validity of the numerous research done on the Medieval Warming Period, arguing that those studies rarely show a continuous warm period over the entire 4 or 5 relevant centuries. But, at the same time, you accept that our most recent two centuries have been warming when, in fact, our current warming reflects even more variability than many of the MWP studies. Most of our current warming has taken place during two periods: 1910 to 1940 and 1975 to 1998, each a duration of only three decades. That would hardly qualify, according to your own “standards”, as a global warming. You have inadvertently denied even your own mantra, climate change, by insisting, in the case of MWP studies that, to be valid, it must not take place, and denying, in the current warming, that it has taken place. DavidR #107 and 109 – you are wrong on 2 counts. First, the article is right in its statements. The figure of “97%” is indeed derived by a mere 75 scientists. That 2500 agreed with the statement that man was PARTLY to blame (read the question again – that makes 3 wrongs on your part) is immaterial because they did not claim “82%”, they claimed “97%”. nor can you even claim “82%” since the real figure is only 25%. Another 6% disagreed, and 69% had NO OPINION (the correct way the survey should have been reported). Second, you claim that “selected because they had professional knowledge in the area”. This statement is not supported by any quantitative or qualitative evidence. There are many sub disciplines in the sciences surveyed, most not having anything to do with climate. So your statement is false without proof to the contrary. The researchers claimed that 82% of the scientists who responded to their survey and 97% of the climate scientists who responded agreed that anthropogenic global warming was occurring. It is only contrarian bloggers who have claimed otherwise. 1. The scientist claimed to work in climate science. 2. The scientist had published at least 50% of their work in the field. a. Not a qualified scientist. The survey was sent to all scientists who were recorded as working in the field of earth scientists according to a specific US register. Please check the methodology of the survey before making unsubstantiated allegations. The survey does not claim that AGW is occurring, again this is contrarians distorting the evidence, it demonstrates that scientists working the field accept that global warming is occurring. Note the terminology was “significantly” not “partly”. Partly could be anything above 1%, significantly implies that it is a major factor. No, it is not “contrarian bloggers” who claimed that. Indeed, the fact that the raw data (unusual in climate science) was made available showed that at least the researchers were not trying to “hide” any numbers. You quote Wiki (a dubious source), yet you do not want to quote any of the numerous other sources that merely quoted the 97% without any further qualification. So when those “other” sources quote the 97%, they are merely pointing out 75 (not 76 according to the raw data – as 76 of 79 is 96%, not 97%), hardly a “vast majority” of qualified scientists. In addition, the researchers asked over 10k scientists to participate. If they were not qualified in the first place, why where they asked? Here comes the disingenuous part. After not getting the results they needed, they had to cut down the sample size until they did. I can do the same thing. I can ask 100 people “Is Climate Science a real science?”, and when 80 do not respond, and 15 say yes, I can cut the sample size down through arbitrary means (since “Climate Science” is not a discipline in itself, but rather an area that requires multiple disciplines) until I get my desired results – 2 out of 3 say no. That is what they did. As for Monckton – you are again being disingenuous. He knows far more than you do about the field, and perhaps far more than most of the respondents (we do not know who they are now do we?). The only thing you do know is he has no degree in the related fields that contribute to the science – yet that has not stopped most of the clowns from pontificating on the subject (James Cameron and algore spring to mind readily). So the “contrarian bloggers” are right to point out the hypocrasy of the figure since it is contrived to begin with. And you are wrong to question something you know nothing about (but it is your right to do so). All of those questioned were qualified in earth sciences, some of them worked in climate science. The researchers quoted both the overall figures of 82% support by all the respondents and 97% by climate scientists. They also provided figures for other disciplines such as geologists and meteorologists. There was not arbitrary elimination of parts of the group as you claim. These figures are based on the actual responses. It is fairly typical of reporting of surveys that the uncertainties stated by the researchers are not reported. However there can be little doubt that the actual figure for climate scientists is above 90% base on this survey, and when combined with other surveys which produced similar results we can be fairly confident the figure is above 95%. The 82% figure for the entire sample is much more robust. Contrarians quibbling about the exact measure are just ignoring the evidence of an overwhelming consensus among both climate scientists and earth scientists that AGW is occurring. Whether its 90% or 97% it qualifies as overwhelming support for the view that AGW is occurring. It certainly isn’t 66%, or a minority, or anything that would qualify as uncertainty about the position. DavidR #114 – all of which means nothing to your original point. You are justifying the survey, its methods and conclusions, yet your original point was that the “contrarian bloggers” were wrong. In fact, they are right. It is 75 only. And nothing you have written has changed or refuted that fact. But I will leave you to one more thought. The “survey” that you point to of the “overwhelming” majority is worhtless scientifically. It is nothing more than a beauty pagent and has no scientific value whatsoever. Any reputable statistician will tell you that. You are correct the figure was 75 out of 77 or 97% as stated. So both the bloggers and the researchers were using correct figures. Being unable to refute the survey, with any alternate evidence, blogers then had to try and destroy the validity of the survey. So bloggers claim that the scientists were “self selected“. This is wrong. They were selected because the were on a registry of earth scientists. All the scientists on that registry were offered the opportunity to respond and over 30% did. A figure that the statistics industry would consider highly significant. This survey is one of the most methodologically accurate and significant surveys of the opinions of scientists, albeit one focussed on Earth Scientists. Having emphasized the figure of 75, which in the context of a survey is highly significant the blogs portray it as if there is some likelihood that the rest of the climate scientists would have a different opinion. This is highly unlikely and the bloggers have no evidence to support their views. The bloggers, having no evidence to support their views, are forced to attempt to denigrate the evidence we do have. Note the claims above that the researchers deliberately excluded scientific groups that the blogger, without any justification, claims would have alternative views. Note the claim that the group of scientists was “whittled down” to achieve the outcome the researchers wanted. These claims are just dishonest nonsense. The researchers had a methodology for determining which field scientists worked in. They applied it systematically for all fields including climate scientists, meteorologists and geologists. It was not falsely constructed to create a specific out come as the bloggers insinuate. Bloggers on the other hand completely self constructed evidence. The Oregon petition, or James Inhofe’s list of a 1000 scientists who disagree with global warming have absolutely no statistical meaning. But blogworlders trot them out regularly to claim that there is NO consensus. The critical point is of course that the science itself leaves us in no doubt that anthropogenic global warming is occurring and will have significant effects on our society. There’s no getting away from that no matter what irrelevant nonsense bloggers argue with. 3. therefore claim B is true, or has its credibility unduly enhanced as a result of the proximity and association. It is not fallacious to claim that the scientific teams researching climate science have expert knowledge in the field. It is fallacious to claim that Anthony Watts or Lord Monckton have expert knowledge in the field. Most academic disciplines, follow a distinctive methodology, Engineering is different from science, law is different from medicine etc. One of the principal things to be assessed when examining evidence is whether the claimant has followed the methodology of their discipline. The Illinois survey followed good statistical methodology and was therefore robust with in that discipline. James Inhofe’s collation of scientists follows no methodology and is pure spin doctoring. What we see in so many blogworld posts about climate science is simply unscientific opinions. Meta-studies covering all the global temperature groups show a strong correlation between their results. I have yet to see one scientific study of global temperatures over the past 100 years that does not identify the current warming. I have yet to see a single study that has stood up to scrutiny that suggests a cause other than CO2. One does not argue against nonsense and innuendo by quoting nonsense. One just dismisses evidence that does not meet basic methodological guidelines and relies on the evidence that remains. The evidence that remains shows overwhelming, based on observations of life on earth, not ‘models’ that AGW is a server and growing problem. Oh wow, it took the genius DaveR 6 hours 28 minutes to finally deliver his piece de resistance. Drumroll please. Aaaand what do we have? Oh dear, yet another argumentum ad verecundiam. Dave, you may genuflect at the altar of your false prophets till your knees bleed. Just excuse us for seeing them for what they really are – a bunch of fraudsters in lab coats who hide and fudge data and who belong in the Big House. You might also look up the recent statement of one Ottmar Edenhofer. It’s not particularly scientific but shows that you’ve been right royally suckered and are too stupid and pig-headed to admit that this battle has never been about science. The bloggers, having no evidence to support their views, are forced to attempt to denigrate the evidence we do have. Denigrate? Perhaps your comment got misdirected from another blog? pointing out the facts and the truth is not “denigrating”, but “enlightening”. That is all this blog did – point out the source of the 97%. I fail to see how exposing truth is now denigrating, but I must confess I do not keep up on the latest Politically Correct terms. I speak as a non-scientist here (although I did train as a weather observer with the BoM many decades ago,so I am not completely ignorant on the subject), but it seems to me that the ultimate test of any scientific theory is its predictive capacity. If 100% of all scientists agree with each other on the veracity of a particular theory, it will still come to absolutely nothing if that theory fails to predict what actually happens in physical reality. And on this basis it seems to me that Co2 related AGW is a failed theory, and needs to be scrapped. For instance, for three consecutive years (2008 – 2010) the British Met service has applied its massive new computer and its AGW modelling to predict the “barbeque summer” and three mild winters, and we all know how catastrophically wrong these predictions were. And they were not just wrong, but wrong to such a startling degree that the Met has now abandoned its seasonal forecasts. Also, (excuse me if I am wrong here) these predictions were not so much weather predictions, since singular events were not in question. Rather, it seems to me, that these were short-scale climate predictions – the general pattern of the coming season’s weather was the issue in question. The same applies to the Australian BoM’s AGW-loaded models of rainfall and temperature predictions – and Jo has recently posted an article showing how amazingly wrong these forecasts were. Again, these forecasts seem to me to be short-scale climate predictions. In short, the models and theories on which these short-scale predictions were based appear to be absolute failures. So why should we believe that longer-scale predictions for the coming century (where we might expect even more variables to come into play) have any more chance of success than these failed short-scale predictions? I would suggest that until the theory can demonstrate some relationship with reality, it does not warrant the massive re-arrangement of the world’s economy. http://rabett.blogspot.com/2010/11/ottmar-repeats-himself.html. Which particular opinion do you think supports contrarian nonsense. OE: In the course of the 21st century it is not the fossil fuels that will become rare, it is the ability of the atmosphere to absorb additional greenhouse gases. OE: Take coal for example. Worldwide there are about 12, 000 gigatons of carbon in the ground. If we want to meet the goal of not warming by more than two degrees Celcius we can only put about 230 gigatons into the atmosphere by the end of the century. That means that most of the coal reserves cannot be used. The science has been clear on this for a very long time. In politics, until now, no one is has been willing to say this in public. The research was robust and the results accurate. Having no evidence to refute the position contrarians simply focus on the fact the climate science is a small field. They ignore the fact that the overwhelming body of earth scientists as well as EVERY major scientific academy in the world accepts the science which shows that AGW is occurring. Before claiming that scientists are fraudsters how about providing some evidence that is validated beyong the rantings of blogworld. The scientific community is extremely unforgiving towards fraud. Blogworld however is replete with dishonest and fraudulent allegations against scientists, none of which have been substantiated. I now challenge you to list the official position of every major Scientific Academy on this issue. Since you do not qualify, you cannot use weasel words like “Astronomy knows nothing of climate”. I did not make the rules, your own words have set them. And while you are at it, please show us how the “overwhelming body” can be derived from 75 opinions. Or perhaps provide some concrete proof of that assertion as well? You’re a one-trick pony, DavidR — the only argument you have is to believe the “authorities”, and insist we do the same. (Well, if we don’t count the pathetic ad hominem attacks on anyone who doesn’t share your near-fanatical degree of blind faith.) The idea of actually analyzing the arguments and data is beyond you. One wonders what your Icons of AGW would have to do to lose your faith? Perhaps faking data, destroying data, trying to destroy the careers of opponents? Perhaps conspiring to break the law by keeping their (publicly funded) data out of the hands of possible critics? Using a single tree as a proxy for the entire N. Hemisphere? Using “statistical methods” that produce the same results from random noise (thereby showing complete ignorance of basic statistical methods)? Is there anything at all they could do that would shake your faith? Blind faith is admirable in piety and love — it is grotesque in science. Preach as you will, we will not be converted to irrationality. Without a demonstration of predictive skill, the entire CAGW political and social agenda is simply an attempted scam. Your refusal to address the failure of CAGW theory to make an accurate prediction is painful to observe, for it shows just how desperate you are to believe in the theory. This desperate desire to believe indicates, as so many others have said, the presence of a type of religion. It has nothing to with science. This is confirmed by the virulence of abuse levelled by CAGW believers against the infidel “deniers”. And in inadvertent slips of the mask, such as the infamous 10:10 splatter video, we see the same desire to “kill the infidels” that we see in another contemporary religion. Belief systems upon which people depend for the security of their sense of self tend to produce aggression when challenged. I must confess that I am amused to observe that this new secular religion of CAGW is mostly practised by sneering, atheistic, postmodern deconstructers of all religion. This new religion is, of course, actually a sub-religion within the wider church of Marxism. In the same way that academic Marxist-feminism has absolutely nothing to do with the liberation of women (because if it did, it would not be silent regarding cultures around the world that repress and abuse women), academic CAGW promotion has absolutely nothing to do with science but is simply another stick the “Progressive” Left wants to acquire to bash Western culture and capitalism. It is obvious that committed proponents of CAGW (such as yourself) have no real interest in the science, but are only interested in undermining capitalism, redistributing wealth and ultimately destroying the West in order to facilitate a UN world socialist government. But this hockyschtick is totally busted, David. Time to look for another weapon, I suggest. Just one location for this particular interview. Google Ottmar Edenhofer yourself if you think this is a dastardly “denier” plot. Come back after you’ve read it all. No doubt you’ll manage to rationalise your way out of any uncomfortable realities of your belief system. I should add that some UN chick let the same smelly cat out of the even more smelly bag just recently. It’s never been about science, Dave. The success of those predictions without alternate explanations is sufficient to convince me that we have a serious issue on our hands. The lack of evidence for any other explanation and the poor quality of the evidence relied on by contrarians is enough to convince me they are wrong. I am happy to examine your ‘evidence’ but not gullible enough to accept the contortions of the facts that are a presented as evidence. You see, that’s how most of the people still reading this thread perceive your arguments. Temperatures increasing fast — gullible — it’s the temperature anomaly that is higher on most figures used to show “global warming.” Put that temperature anomaly change on a figure that shows real world temperature variation. Increased extreme climate events — gullible — it’s the reporting and reportability that’s increased, at least in part, and natural climate variation. The idea that you are going to change the mind of any of us that are still reading this thread — gullible. Do you have a source for that claim? All data that I have seen indicates that temperatures have been generally rising for the past 8000 years (actually longer – since the last ice age. Source again? Data shows sea levels rising at a slower rate than previously. Could you put that in perspective? As in, has it never declined before, just started to decline for the first time in history, or is just disappearing without precedence? Again, can you put that in perspective? Are you contending we have never had extreme weather, or that the rate is increasing? And if the latter, could you please document the change (show us the extremes in the past versus the present). What models? the ones that predicted a mild winter for the UK this year? The ones that predicted a drought in Oz this year? The ones that predicted an end to snow? Which ones are now getting more accurate? I am glad you are not gullible, however you seem to want us to be by making outlandish statementes with no data to back them up. However, you are free to do so now. Perhaps that would get rid of that nasty tic you have. Argument from authority is when someone says: A is true because B (an “expert”) says so. We skeptics don’t talk about “enhancing credibility”. Things are either true, or not. (And we may not be certain which is the case, but credibility is about reputations, not molecules. Elements of the periodic table exist, or not, but we don’t measure their “credibility” quotient. Which skeptic framed an argument with the form of X must be true because Christopher says so? No fallacies busted here. Sorry about that. It’s rather special the way you distort the key-phrases randomly and repeatedly, continuously using argument from authority while denying that you do so. Perhaps you are a commentbot? How would we know? PS: The Guide for comments specifically mentions that frequent commenters need to avoid breaking laws of reason. All of these things are shown over and over to be false on this blog by reference to actual facts, not to mention sound argument. It is claimed that 2010 is the warmest year on record. But no less an authority (since you like authorities) than Dr. James Hansen of GISS agrees with the assertion that the very small (100ths of a degree) measurements cited as proof of this actually mean no such thing. See this refutation on Climate Depot. I think the facts speak louder than the fiction. I just googled “97% of climate scientists agree” I only get 141 links I thought it should be 3,920,000? Can someone explain, has it changed a lot over time it could mean realizing is an error it was pulled? BTW do you remember when everyone was raving about the percentage change. You know CO2 ppm has grown 20% in the last few decades stuff. Here in Canberra we have headlines like road death toll up 30%. Means about 4 people, maybe that why they try so hard to push it down. If we can get down to 8 on average then the headline would be “Road Death Toll up 50%” for 4 people. B/S everywhere. UPDATE:- The real truth behind the originally contrived 97% Consensus claim by Doran & Zimmerman is exposed by David Burton doing some digging, over at WattsUp… . An oopsie in the Doran/Zimmerman 97% consensus claim shows the full report on which the paper is based revealing yet more about how the reported figures were selected to achieve maximal effect.